Expandable Post binder. 4 inch minimum document capacity - expandable to 6-7 inches for READABILITY. Yellow Poly case is double thick and precision hinged. HDPE is an extruded engineered plastic binder. Savings of 30.00 per expandable binder when compared to turned edge glue wrapped cloth and metal hinge types. Gas safety manuals, the term Large Catalog Binder merely refers to a common term given to post style binders. Round ring RR and D ring active binders damage the paper documents they were Supposed To Protect once the sheet count is 1.75 inches and larger. Yes, the binder industry ï¿½short sheetedï¿½ for years. Selling you large D ring binders that lacked dynamic performance. Yellow HDPE is recognized for usage in natural gas storage, gas pipeline technology And Gas Distribution operating and maintenance manuals. Large capacity operating and maintenance expandable post binder manuals control live paper documents. Manuals have increasingly been converted to electronic storage and post binder usage reduced. Record keeping on paper has received increased regulatory scrutiny due to certain high profile accidents. Investigators want more than an Ipad or tablet. FERC wants paper records annotated by key employees. Annotated drawings,inspection records. The freshest ink. Connection records must be retained and available for oversight review. Two years plus. New York City is vigorously resisting culpability by litigants with reference to the East Village Tragedy in lower Manhattan. Three buildings exploded and the media immediately started publishing reports of ancient gas pipeline connections over 100 years old. Investigations have revealed illegal gas connections to steal gas from Con Edison. Mayor Bill De Blasio signed ten bills pertaining to gas safety laws enacted. A land lordï¿½s Gas Safety Certificate is now important legal document that must be furnished to tenants. Small customized yellow poly ring binders may be issued to gas company employees. Trojan Post , AJaX and QCV post binders are three different popular post binder mechanisms. Nickel plated steel is stamped into dynamic mechanisms that last for many years. Ajax post binder has a surprise. It has a piano metal hinge inside that maintains large amounts of paper documents with integrity. Super Duty, 11x8.5 inch sheet size, 3 post. Gas Operating Maintenance Manuals - Gas Pipeline Safety. Big binder is 4.63 inches wide in contracted form. 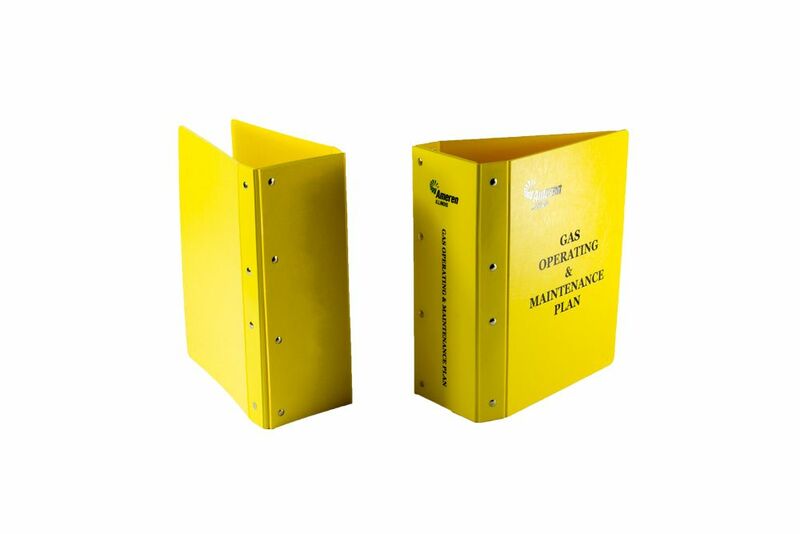 Yellow binder Large for “hands on” maintenance manuals and pipeline Safety. Yes you may purchase modest quantities.